Tonight is the first evening where I do not feel completely drained post-Sandy. It’s taken me a good three weeks to recover from the sheer physical exhaustion of spending a week without power and water, and maintaining a sense of normality for the girls. Alex and I worked our butts off. It paid off but spending a week in hunter-gather mode was not fun. Our situation was not that bad. It could have been far worse and every day when we went out for supplies we saw how Sandy had decimated our neighborhood. The houses with basement and ground floor apartments that circle our high rise were written off. Businesses are still closed. Parts of the sidewalk jut out over a foot. The wall of a sports field was toppled. A local school has had men in bunny suits gutting it for three weeks. Pre-Sandy: a local restaurant preps. Post-Sandy: it’s still closed & their insurance is making them move their kitchen from the basement to second floor! The ground floor apartments of our building are now empty. The hallways have been stripped off their carpet, and plaster on the walls removed. You got use to seeing peoples belongings out on the side of the road during that first week. Water damage and the risk of mould means you can’t keep anything. Once the apartments and businesses had been stripped of personal belongings then the insides were gutted. So all in all spending a week without power and water but still having a roof over our heads, and being able to afford to eat out meant we were lucky. Tired and grumpy but lucky. Baby Bjorning the girls to sleep by walking and walking around our building. My main fear with Sandy was that the weather was going to linger (or our building would be cut off due to flooding) and we’d be stuck with just the supplies we had. We definitely prepped better for Sandy than Irene the previous year but there is still room for improvement. We didn’t have enough water for the six of us (Alex’s parents had been visiting and the hurricane meant their flight was cancelled and the B&B they were staying in couldn’t accommodate them) for a pre-longed confinement. On the evening before the storm I did a ton of baking to use up the perishables and to make sure we had enough dry food for the girls. So we had enough food for the girls for almost a week. Cheesy biscuits, digestive biscuits, prune and banana bread, apples, bananas and pouches of lumpy baby food. Not perfect but it would keep them going. We probably could have lasted a good few days on the dry food we had in the flat. It would have been pretty dull nosh, and we’d have been hungry but with careful rationing we could have eeked out the dried fruit, biscuits, bread, cheese, fruit, and tinned fish. Thankfully I never had to serve my in-laws half a banana and can of sardines as a meal because once the hurricane had past the weather, and flooding did not linger. The next day (Tuesday) we were able to go for a walk around the neighborhood, and assess the situation. There were pockets of power and one grocery store was open. Praise the gods of Shoprite! Every single socket in the store was being used to charge phones, laptops, iPads, etc. I spent 40 mins charging my iPhone with Zoey whilst Alex queued up with Naomi to buy supplies. This meant that even if we didn’t get power back in our building we’d be able to come out twice a day to buy supplies (milk for the girls). We could live on ham and cheese sandwiches should it come to it. When we got back to our building the situation had slightly improved. Whilst the building didn’t have power it did have a generator that provided power to the common areas (hallways, gym, rec room and lobby). The lobby had been set up as a charging station with power cords, a coffee machine, microwave, and a TV. The other residents were crammed in watching the news, and powering up. This was a game changer; now we could buy microwave meals twice a day, and have hot food! Whoop whoop! The afternoon before the hurricane struck I filled the tub with water because I was worried that if we lost power the building pump would stop working. It did, and I’m so glad I filled the bath. This water was key to the level of comfort of our urban survival adventure. We could use it to wash-up, bathe (brrr!) and then flush the loo. To keep things sanitary we need to have a rigid flushing schedule as we had to ration out the water as we wouldn’t know how long the tub water had to last. On the Wednesday we headed out to Target (Zoey and I had to walk as there wasn’t enough room in the car) because we had gotten word they had power, supplies and clean bathrooms! 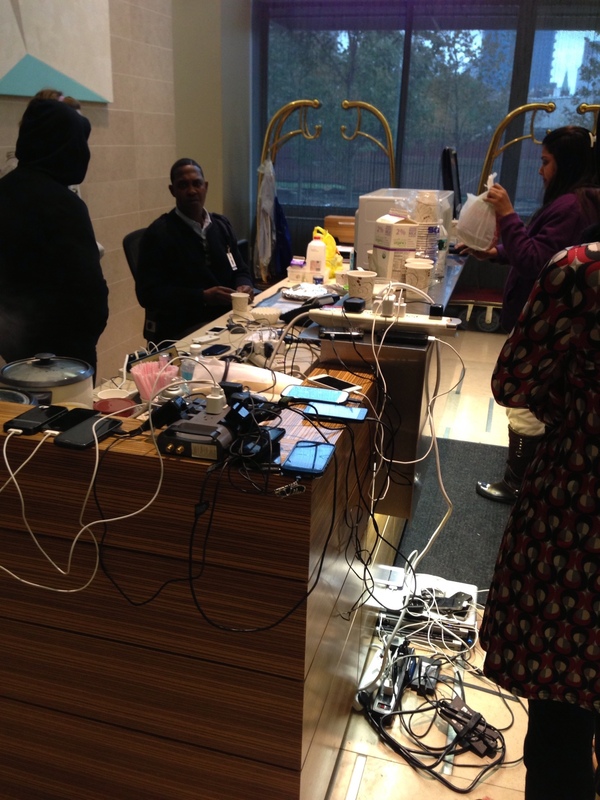 Once again every socket was taken up with people charging all their devices, there was working wifi so people were tapping away on their laptops (and later in the week I was able to FaceTime my mum), and the bathrooms were gleaming. This was the first time I’d looked in a mirror in almost three days. Ugh. The Sarah Connor lifestyle is not pretty. 5-6am As soon as the girls woke up walk down 15 flights of stairs to the lobby (enroute we’d stash two gallon jugs in a supply closet outside the gym on the 5th floor as the loo there had water) and give the girls their bottles, make coffee or tea, charge phones and nuke some oatmeal. 7-8am Once it got light we’d walk back up the 15 flights to the flat for breakfast proper with Alex’s parents (stopping on the 5th floor to fill up the gallon jugs), and get ready for the morning walk. 9am Walk back down 15 flights and head to Target. I went on foot with Zoey in the Baby Bjorn, and the rest were in the car. Use Target’s bathrooms, and buy supplies. We bought milk for the girls twice a day (morning and later afternoon), and would pour it into two thermos so that it would stay cool. Sometimes we’d have to walk to two or three stores to find the milk. 10-11am As the week progressed more restaurants opened so we would pick somewhere for lunch. 12-1pm Try to push the girls as late as possible for their second nap, and then walk them around the corridor in the Baby Bjorns. 2-3pm Once they woke up hit up a store for their milk, and microwave meal for the adults. 3-4pm Back to the apartment building to nuke the food for an early bird “dinner”, charge phones, lug more water or supplies back to the flat and try to entertain the girls until it started to get dark. 6pm-ish Bathe the girls (we bought a kettle and three cases of bottled Poland Springs from Target), get them ready for bed and evening bottle. 7-8pm Once the girls were in bed with hot water bottles we’d do the washing up, flush the loo and prep for the night/morning. As you can see it was pretty laborious. By late on Thursday the building had managed to get one elevator working off through generator power. Hurrah! This was huge for us as it meant we could finally use the stroller and not have to Baby Bjorn the girls most of the day, and we could also bring up the extra water we’d stashed in the car, and get more loo water from the 5th floor. Then on Friday Alex’s parents flew home so we were two souls down in the apartment, and we found out that a local gym was letting people shower if you signed up for a guest pass. So on Saturday morning we had our first hot shower in 5 days. Oh. My. Gods. It was amazing. I had the water burning my skin but it felt so good. By Sunday we were dog tired. Tired of all the moaning of people in the building about how we were the only block in the WHOLE of the Garden State without power. Tired of having to be out for most of the day. Tired of chasing the girls around to eat. Tired of having to seek out milk twice a day. Tired of having to carry our lives around with us. We did try to make it fun for the girls, and we brought their IKEA trolley down so they could “help”. But by Sunday we were tired and so over urban survival (friends had offered us to stay with them but the girls were so out of sorts that a change in location would have made everyone miserable). Alex’s office was reopening on the Monday, and he was worried about leaving me with the girls. But since we had a routine and one working elevator I was fairly optimistic that I could get through the day. Then as if by magic the power came back on that night. Then the pumps started working and we had water once again. Hurrah! I hope your life gets back to normal soon. I can’t even imagine having your strength and tenacity. Good luck. Thank you! Slowly but surely we are getting there. Thanks for writing down the experience. I’ve been curious to know how you got on without power in the middle of the city and in an apartment building. It sounds gruelling, but hurrah for living in an age where there are microwaves and microwave meals. Imagine going through this in — say — the ’50s with only an electric stove? Luckily the girls are at that transition stage so going back to lumpy purees for a week wasn’t too bad. Of course trying to get Zoey back onto pasta is always fun! We met another parent of twins in the lobby. Her 2 yr girls were refusing to eat cold food so was having to decamp to a hotel. Glad we were able to stay put as the girls don’t like new places to sleep at night. What enterprise, your account of your post Sandy week was thought provoking, the blitz spirit just kicks in , the survival of the fittest, humans are not so advanced really. It sounds like the business owners where kind and helpful too?! Yes, business owners were great letting you charge and hangout. When Starbucks reopened a few days after the hurricane they made a fortune! Top store in the Region. It’s been great having mum here as its taken me 3 wks to recover. No downtime with young kids. You are a family of heroes! Although I pity the poor units who lacked a qualified classicist in their ranks – I wonder how they coped?